Making Java technologies such as JDBC available to macOS applications. 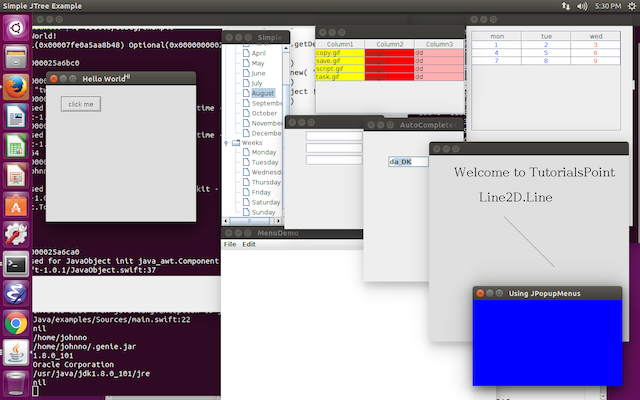 Giving Swift applications on Linux a portable user interface using Swing. Making business logic in written in Swift available to Android apps. private static var toString_MethodID_7: jmethodID? On macOS, this has been used to generate frameworks bridging the java.lang, java.util, java.sql, java.awt and javax.swing packages along with the Apple specific additions in the com.apple package. This makes the Java apis available with auto-completion in the Xcode source editor. The final application can be a ".app" or a command line utility which should be portable to Linux using the Swift Package manager. For Android, the code generator can generate JNI code for a pair of interfaces from Java to Swift and from Swift to Java saving the developer the chore of a lot of error prone manual stubbing. Development inside Xcode with the Oracle JVM is a little more complicated. It seems that JNI_CreateJavaVM generates a SIGSEGV internally as part of normal operation which is trapped using a signal handler so it can proceed on the command line. Unfortunately, this is caught by Xcode debugger lldb and it suspends and will not continue until you enter pr h -s false SIGSEGV into the debug console each time you run the program. The alternative is to not use the debugger at all in your scheme. Perversely, with AWT and Swing on macOS the JVM needs to be created on the main thread while setup code needs to be off the main thread to leave it available for AWT's own runloop. Use the JNI.background and JNI.run methods to achieve this in a portable manner. The swing source in "examples/Sources" shows how to receive events and subclass a Java class to have certain methods such as java.awt.Canvas.paint() be implemented in Swift. More on this later. For Android, consult the modified versions of the swift-android-samples and the associated gradle build system plugin from the Android Toochain. This run on macOS or Ubuntu 16.04, and requires a Lollipop (api 21) or better device. More detaills and context are available in the Swift README for Android and this comprehensive tutorial but hopefully the scripts in the modified gradle plugin take most of the pain out of it. This generates Swift classes and a third Java source src/org/swiftjava/your_package/YourAppProxy.java that also needs to be included in your project. Consult the script genhello.sh and project "swift-android-samples/swifthello" for details. The source "swift-android-samples/swifthello/src/main/swift/Sources/main.swift" shows how to set this up with a native method called from the main activity. out += "Hello "+text!+"! " Forward, Runnable, Listener, Adapter, subclass responsibility and Base classes. For every Java interface the code generator generates a Swift Protocol along with a ProtocolForward class an instance of which conforms to the protocol and can be used to message Java instances conforming to the interface/protocol. For the Runnable interface used in threading the converse needs to be possible where Java code can call through to Swift code. This is performed using a Java proxy class which has a pointer to the associated Swift object and a "native" implementation of the "run()" method that calls through to Swift. On the Swift side this is surfaced as the "RunnableBase" class which can be subclassed to provide a Swift implementation of the "run()" method callable from Java. This approach is also taken for processing events and all interfaces with names ending in "Listener", "Manager" or "Handler" also have "Base" classes generated for subclassing along with Java Proxy classes. On macOS and Linux these classes are compiled into a jar file ~/swiftjava.jar using the genjar.sh script for this to work. Any interface/protocol from a Java interface can be added to a class to enable it to be passed to Java provide it's name ends in Listener. The implementation is a little complex but does not have an appreciable overhead. structs can also be made accesable to Java in this way but the object will no be live i.e. a coy of the struct will be taken. Some event processing is also done by subclassing concrete classes that have names ending in "Adapter". Slightly modified Swift "Base" classes and Java Proxies are also generated for this. Other classes have methods that are intended to be responsibility of the subclasses such as java.awt.Canvas.paint(). 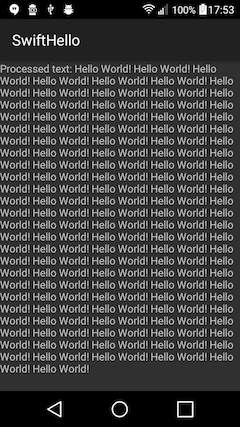 A list of these methods needs to be maintained in the code generator unfortunately. If one of these methods encountered a Base class and Proxy is generated for the concrete class that can be subclassed. As these "Base" subclasses can't close over variables in your program you may want to have an initialiser to capture these instead. There is a bit of a standard dance that needs to be performed. Instantiate the "Base" superclass and assign it's javaObject to your classes' javaObject. Due to the use of generics you'll also be prompted to provide a null implementation of the "required" initialiser. Consult the Swing examples code for further details. This License does not apply to the code generated from the Apple distribution of the Java VM which are provided under the provisions of "Fair Use" and your use is ultimately subject to the original License Agreement.